Remember this unique black soap? I blogged about it last month here. After several weeks of using it, I'm fulfilling my promise of writing a review. But please, don't get the idea of me becoming as a beauty blogger. LOL I'm way far from becoming one. I purchased my first black pearl soap last February 15 from Watsons. You know what happened to me over the past weeks to months. I'm occupying myself with concerns that don't really happen in the first place. LOL Hence, one of the casualties of my self-imposed unnecessary stress is my skin. I'm nearing that age when either-I-make-it-or-break-it in every aspect of my life. I panicked and as expected, I stressed myself. I can handle stress but not early signs of aging. Hence, Watsons has become my happy place lately. Prior to writing this review, I googled reviews from other bloggers. Most of the articles I read gave great reviews. A few complained but there were more positive reviews. Amidst the many bloggers who complained and praised the product, here's my own take. 1. I find the small soap affordable at Php 65-70. I can't remember the exact price. They have a larger size at Php 150 (if I'm not mistaken). 2. Despite the small size, it lasted almost a month to me. I used it every morning and before I sleep. 3. It lessened the nasty white heads. 4. Of the several weeks of using it, I never had pimple eruptions. I was convinced that it prevented the occurrence of pimples because I'm depriving myself of sleep over the past weeks. 5. It has a unique cooling effect. For me, this is one of the product's strength. Some facial soaps and facial wash would give me a mild burning sensation on some areas of my face (the side of my nose where most black and white heads usually thrive). This painful sensation was replaced by the soap's unique cooling effect. 6. My skin does not feel dry, tight and flaky after using it. My problem with the usual facial wash is the strong after effects. My oily skin often ends up clean but too dry with some facial wash. I have to immediately lather moisturizer otherwise, my face would end up flaking. This soap however addressed my recurring problems with most facial wash.
7. It doesn't have any strong scent. For some reason, I appreciate odorless soaps especially for my face. 2. It stains other soap and the soap dish. 3. It didn't vanish those nasty black heads. It only addresses the whiteheads. 4. Although it's a minor issue, I don't like the cheap inside packaging. The soap was enclosed in a plastic wrap with a strip of scotch tape. 5. It has limited distribution channels. It is only available in Watsons and Hortaleza beauty shops. 6. I haven't seen an expiry date, which is critical among all natural or organically produced beauty products. (UPDATE: My recent purchase already included an expiry date). The box does not mention it's organic but the company website identifies it as part of its organic line. You can learn more about the company that produces the soap here. Yes. I love its cleansing capacity, cooling effect, absence of harsh after effects and the affordable price. Haha I forgot about it. Thank you for reminding me. I'm updating it. Although another thing I appreciate about the soap is the absence of any strong scent. I've never heard about black soap before, but this sounds like you've found something that is really working for you. Now I need to find something that will perform miracles, lol. Oh! it sounds like an over all success!!! That cooling sensation sounds amazing!! thank God you dont have any plans on being a beauty blogger... i'll sure miss you in case. :)))) happy weekend! Hi Bernadette! Yup, the soap addresses both black and white heads. It can remove white heads, but not so much sa black heads :) I tried it kasi mura lang haha Sayang din, it might work for you. i'm a huge fan of this soap! i've used it effectively to get rid of my unsightly farmer's tan. this soap + nivea's whitening lotion, the 50x one. problem is, i don't use it continuously so i have a slight farmer's tan again LOL. some people say that for this to be effective, you have to leave it on for like 3 minutes before washing it off, which is fine for the body i guess, but for the face omg, it's starts to sting within a few seconds. i use this for my face too when i remember to buy it and it's pretty good. i pick my face a lot and get ugly scars because of it. i think i can say this soap helped lighten my scars as well and i had no breakouts at all. Yes you have to leave it for a while to feel the cooling effect. It didn't give me the feeling of having stings. Although when I used it after getting toasted and roasted from Palawan, I can feel a minor burning sensation on the sides of my nose. Must be because of the sun burns that are gradually peeling off. Hi Rhyck! I haven't tried this soap to remove scars. If I may suggest try using Contractubex or Bio Oil. I used both in removing scars. Based from my experience,both are good in removing newly acquired scars. The old scars, it will take some time. They will not totally remove but eventually the dark color tends to fade away. 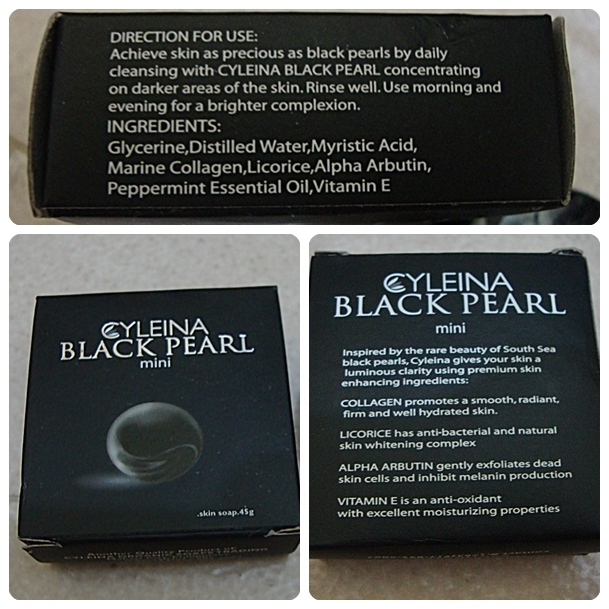 Actually, di ako masaya sa Cyleina black pearl soap. Back when bago pa lang syang product, may mga reviews sa Girltalk, eh alam mo naman, madali akong mauto, bumili ako ng 10 sa isang reseller. Waley, waley effect sa skin.